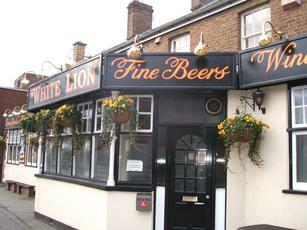 First stop in Watford yesterday morning was the White Lion. I agree with the previous review. Although, the Woodforde's Wherry appeared to be on better form. There were also a couple of guest ales - Fuller's London Pride & Tring Moongazing. I had the latter, which was acceptable. The site of staff chopping up carrots and potatoes in the bar was a little strange. But, it was fairly friendly and we were offered some complimentary sandwiches. A reasonable option near Watford Junction station. One of the few establishments in Watford that still seems like a pub - unfortunately the ale (Wherry) was dire. Revisited last night and my favourable impressions were confirmed. Good pint of Wherry, a lively but good-natured karaoke and traditional if run-down public bar. Oh, and I quite fancy the barmaid. I still think it's the bet pub in Watford. In my quest to visit every pub in Hertfordshire, the experience of "doing" Watford was at times dispiriting. Snarling bouncers, putrid bitter, brain-shattering music, and moronic drinkers. The White Lion was the last pub I visited and by chance I'd have to say this was probably the best drinker's pub in the town. Only a couple of real ales were on but the Woodforde Wherry was excellent, the barlady had a sense of humour, there was a nice local clientele, and the women's footy was on the telly at a discreet volume. Nice beer garden at the back, and plenty of cosy nooks and crannies. A bit away from the centre, but definitely worth a visit if you're a connoisseur of proper town pubs. For some reason, the google maps link to this pub goes to Soissons in northern France.